repacking them as my eleven year old unpacks them. Trying to understand how his brain sees them makes mine ache. readers with autism may especially benefit from the direct presentation of books like the Max & Ruby board books of Rosemary Wells. Max's First Word is a classic of cute pictures and gentle humor. So are Max's Ride, Max's Bath and the others. But doesn't a time come when these must be put away? Isn't almost twelve too old to spend time on these? Is it that he wants to read but doesn't want to spend more than two minutes on any book that isn't Mother Goose or song lyrics? as a picture book. And no, he isn't memorizing the words. The page numbers, sometimes, but never the words. I'm still unsure how to handle this. What do you think? Does your child do this? and concentration camps. Not only does he not understand these concepts, he vehemently protests reading chapter books at all. Of course, he has to read something other than Seuss. When I choose for him I usually pick a title like The Mouse Family Robinson which tries to bridge the picture book - chapter book gap. by the house cat. When one of the youngsters wanders off and is nearly eaten, he decides they should move. So off they go to a cat-free house. The pictures (by Bad Kitty's Nick Bruel) and motivations could not be clearer. My boy tolerated the book, and it should engage any child interested in mice. 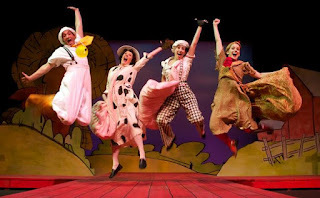 Click Clack Moo and my oldest boy are contemporaries. I remember hearing about the book (which won the Caldecott) and seeking it out with satisfactory results. He's enjoyed the rhythm and word play of the book and its successors (Dooby, Dooby, Moo is a particular favorite). older kids remember to reiterate important words like "boing." so I grabbed his younger brother instead. her book tours to schools as well as to bookstores. 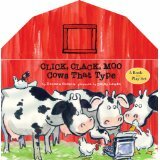 autism and her books, she instantly referenced Click Clack Moo, a book which she says parents and teachers have mentioned as a favorite of kids with autism. the text includes alliteration and rhythm. between the book and the musical (see previous post). "It's the pages and words I like, all the notes" (the notes the animals wrote to Farmer Brown). Cronin's new book is M.O.M. a very funny "Operator's Guide" to mothers. plans her first monthly Saturday story time for September, 2012.
preschool classroom which included children with special needs. they can take advantage of a very special time. and you would like one, try asking a librarian. That's how the Green Hills story time started. It's been a great success. reading louder is no big deal. She's happy to do it. new and wonderful for our kids with special needs.